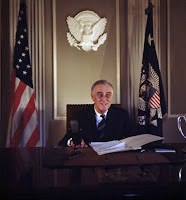 Did FDR Have Two Cancers? 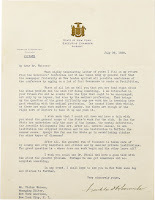 As I have just written a prominent FDR historian, our book presents a scenario that FDR may have had two cancers. This is a understandably tenuous assertion, considering that as yet, it is not accepted that he even had one! While most of the contemporary rumors centered around prostate cancer, obviously we are making a case for the melanoma as well. The basis for this idea is anchored the evidence-based scientific literature. One reason is medical statistics. 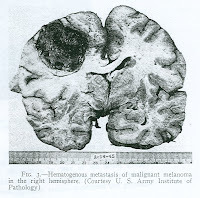 If indeed the fatal hemorrahge emanating from the right side of FDR's brain was from a metastatic tumor as we believe, then it could not have come from a prostatic primary, since prostate cancer virtually never metastasizes to the brain (less than a handful of reported cases in the entire medical literature). On the other hand, melanoma is the tumor with the greatest propensity of all to metastasize to the brain. Over 90% of patients have brain metastases at autopsy and, in 25-50% of melanoma patients, the terminal event is brain hemorrhage! As far as the abdominal tumor is concerned, this is a little less clear. We are convinced that the highest probablity for FDR's weight loss was a partial bowel obstruction. All of the Frank Lahey/George Pack references in the book are testimony to it. It makes no sense whatsoever for America's greatest abdominal surgeon at the time (Lahey) to be offering a prognosis on a cardiac standpoint. 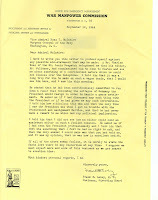 In addition, Howard Bruenn clearly states in his 1970 paper that when Lahey examined FDR in April, the condition was serious enough that it warranted informing the President (quite concordant to what later appeared in the Lahey memorandum!). 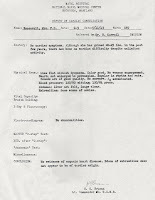 Both prostate cancer and melanoma frequently metastasize to the bowel, though melanoma is notorious for intussusception (intermittent telescoping of the bowel into itself) that produces the intense abdominal pain consistent with symptoms exhibited by FDR at Teheran (November 1943), Hobcaw (April 1944) and Camp Pendleton, near San Diego (August 1944). Short of an open biopsy, for which there is no evidence FDR ever underwent, it is not possible to say with certainty which one it was. Even today, a pre-operative diagnosis of malignant bowel obstruction from melanoma is often missed. 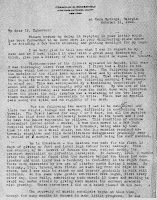 It is our belief that it was indeed melanoma though with less assurance than for the brain metastasis, but the very real possibility is raised that FDR's doctors did not know, and may never have known, exactly which malignancy was the source of the abdominal pain (the "growth" even FDR himself suspected, albeit temporarily, when he told Harold Ickes about it in May 1944). Our discussions with melanoma specialists about the time frame for the maligant bowel obstruction reveals that it is entirely consistent with contemporary thinking. This is not the case for the brain metatastasis, hence we could not postulate that metastatic disease was the cause of the seizures, which appear to have been on the basis of an otherwise clinically silent stroke (Dr. Wold may have been partially right, but for the wrong reason). All of this thinking has evolved over three years of intensive research and discussions with countless expert physicians. 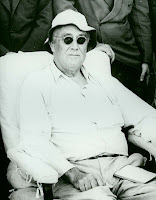 We sincerely hope and believe that it will eventually come to be accepted by historians as the reality of FDR's medical history, though, as all things new and radically different, it will be subject to a vigorous debate. 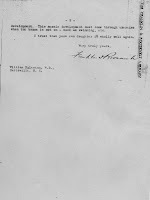 This letter was given to us by Margeritta "Mickey" Allardice, the daughter of William Calhoun Stirling, I've never seen it referred to previously. 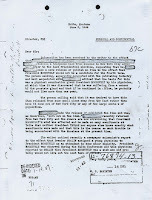 Obviously, this is a censored FBI document, written almost two months after FDR's death. The author is special agent W.G. 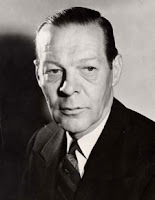 Bannister, a regional FBI director and was sent to Director J. Edgar Hoover. 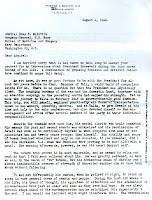 It was probably obtained through a FOIA request but the source is unknown (I will be asking Mickey how she acquired it). 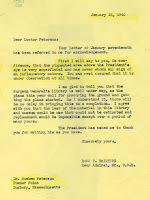 The rumors addressed in the third and fourth paragraphs of the letter center around FDR's mental status at Yalta and his prostate cancer and probably arise from the Walter Trohan/William Calhoun Stirling connection that is the source of virtually all of our present understanding of FDR's prostate problems. The identity of the informant is unknown, though further research into any Montana connection with a New York reporter might provide further insight. 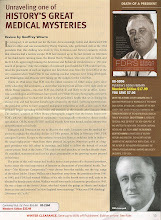 All in all, this is a new, important and interesting document concerning FDR's health. We are happy to bring it to public attention. Here is a 1939 photo of FBI special agents. Bannister is second from the left in the first row. 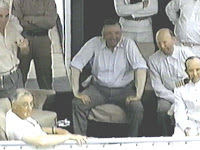 Hoover is the man on the left in the first row in the white suit. to Hoover's left is Edward Tamm, his right hand man. 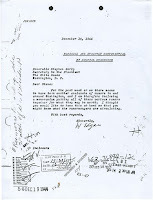 This document, an FBI report signed by J. Edgar Hoover to Steven Early, was facilitated by Hoover's right hand man, Edward Tamm and has been referred to as the Tamm Memorandum in a number of books. 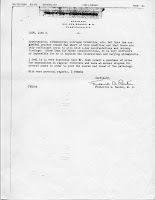 It probably came to light through a FOIA request by Ken Crispell and Carlos Gomez for their 1985 book. 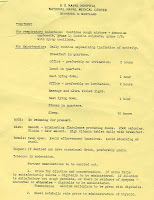 This copy came to us from Margherita Allardice, William Calhoun "Pete" Stirling's daughter. The source of much the information was probably Chicago Tribune reporter Walter Trohan, who most likey got it directly from Stirling. 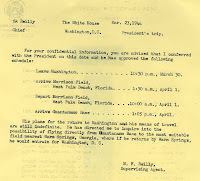 Interestingly, Stirling probably became FDR's doctor thorough White House press secretary Steve Early, his bridge and golf buddy. Stirling was a racist and anti-semite. 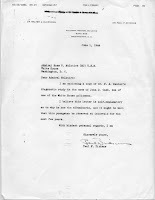 We can date his medical care of FDR to prior to September 1943 because he did not talk to his younger daughter, Mickey, for a long time afterwards because she married a Jew and her recollections of his mentioning his treatment of FDR was from before their estrangement. Early had southern roots and was a descendant of Confederate General Jubal Early. 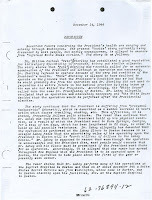 Through this memorandum, Early learned that it was his close friend who had been the source of the rumors that triggered the "avalanche of rumors". 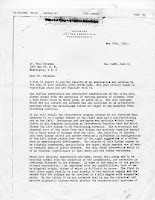 There is no record of Stirling ever speaking about FDR again. The Fala Speech. September 23, 1944. FDR at his best. On September 23, 1944 FDR gave his famous "Fala speech", one that did much to reassure the American voting public that their President was up to the task of running the country for the next four years. 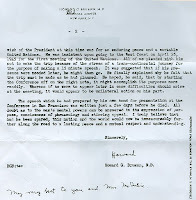 The 39 minute, 30 second speech (only partially seen here) was delivered in a friendly environment at a campaign dinner in Washington, D.C., before the International Brotherhood of Teamsters, Chauffers. Warehousemen and Helpers of America. 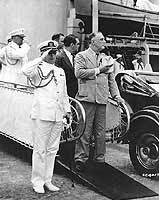 It shows FDR at his very best, despite the fears of his staff and family that, in his weakened physical state, he would be unable to carry the day. His incredible showmanship and guile are demonstrated to the fullest. The clip of the speech begins 20 seconds into this biopic and lasts about two minutes. It's worth the wait! There's also a relatively long clip of the March 1, 1945 speech to congress shortly afterwards. If you have any doubts as to what were getting at with respect to the errors FDR made while giving this speech, this should help. Now listen to the audio while simultaneously viewing the annotated text. What you experience is very convincing- the objective evidence that is one of the major keys to unlocking "FDR's Deadly Secret". These color frames are part of a film made by the US Navy for the President to commemorate his second cruise on the USS Tuscaloosa in February 1940. 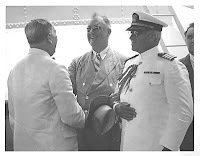 FDR felt at home on naval vessels and , being away from the press and public, felt it was less necessary to pay undue attention to the appearance of the pigmented lesion above his left eye. The purpose of this "mystery cruise" was ostensably to inspect the defenses ofthe Panama Canal. It is quite possible that this, and other voyages, were venues where he cauld have some"work done" to his lesion. 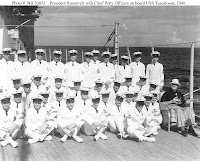 The only staff members on this trip were his constant companion, VADM Ross McIntire, his chief of staff General Edmund "Pa" Watson (seen standing directly behind him), and his naval aide ADM (then Captain) Daniel J. Callahan, who died on the bridge of the USS San Franciso on November 13, 1942 at the battle of Savo Island (near Guadalcanal) and was posthumously awarded the Congressional Medal of Honor. He is seen here boarding the cruiser. The lesion is starkly obvious, in contrast to the shadow (perhaps further attenuated by make-up) seen only ten months later while giving his "Arsenal of Democracy" speech on December 27th. During a performance of the crew Admiral McIntire (second from right) casts a watchful eye on his star patient. Watson is to his left. Callahan is at extreme left. 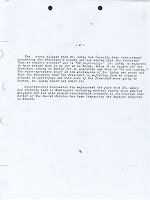 Article reporting the "Mystery Cruise"
With the chief petty officers. On the left- a carefully staged photo taken from the right (Captain Callahan saluting at left). FDR could not take a single step unassisted. "Mr. President, it is always a pleasure to have you on the TUSCALOOSA. We are all sorry to see you leave tomorrow, but we are hoping that you will make another cruise with us soon and the officers and men of the TUSCALOOSA all want to wish you continued good health."